The winner’s curse is a concept from game theory. It states that, in (common value) auctions where there is incomplete information, the winner will tend to overpay. The reason why this is the case, is easy to see. Before the auction begins, nobody knows the item’s market value. Instead, every participant independently estimates the value before the bidding starts. Once the auction finished, the winner of the auction will be the person who bid the highest price. If we assume that the average bid price is close to the actual value of the price (the vertical red line), then winner will have paid more than this actual value (e.g. the black arrow). Winning the auction is thus actually bad news for the winner, because it suggest that the average value that the other bidders assign to the item is lower than what the winner paid. 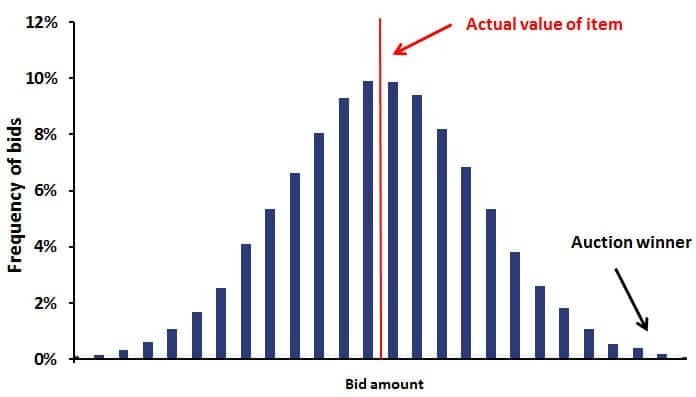 The more bidders, the more likely it is that some participants overestimate the value of the object and the higher the eventual price paid by the winner. One way of avoiding the winner’s curse is by bidding below the value we think the item is worth (i.e. our estimate). By downward adjusting our bid we will probably be closer to the average value, and thus avoid paying too much. The most obvious example in finance are Initial Public Offerings (IPOs). When a company becomes stock listed, no market price for the stock is available. As such, investors need to estimate its market value. Uninformed investors will most likely bid more than the fair value, while smart investors will not subscribe. As a consequence, the uninformed investors will be assigned most of the stock, at a price that’s too high. 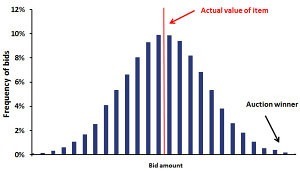 When bidding, we should correct our bids for the possibility that our bids are higher than the actual value of the item. If we win an auction, then there’s a distinct possibility that we have paid more than what the item is actually worth.